The sixtoothed bark beetle is native throughout Asia and Europe. Its primary host includes Scots pine, with minor hosts including pine, spruce, fir and larch. It is not generally a primary pest and is only capable of attacking trees that are already damaged by drought, lightning or pest infestation. It has not been found in the United States. 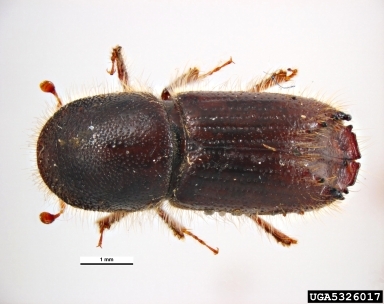 The sixtoothed bark beetle survey is conducted by the Animal and Plant Health Inspection Service, Plant Protection and Quarantine. A Lindgren funnel trap with host attractant is placed on or near the host plant from May until September. If suspects are found they are sent to a regional entomologist for further identification. One hundred thirty traps have been placed in nineteen counties in Wyoming. It has not been found in Wyoming.